Susan Hostetler is a Washington, DC based artist whose work has been shown in group and solo shows throughout the area including galleries and art centers in Washington, DC; Alexandria, Arlington, McLean and Reston, VA; Bethesda, Silver Spring and Chestertown, MD. Her work comprises 2-dimensional drawings and paintings on various substrates, 3-dimensional clay forms, as well as wall and room installations using clay forms. Angie Newman Johnson Gallery, Episcopal High School, Alexandria, VA with artist Jean Sausage-Knodt. 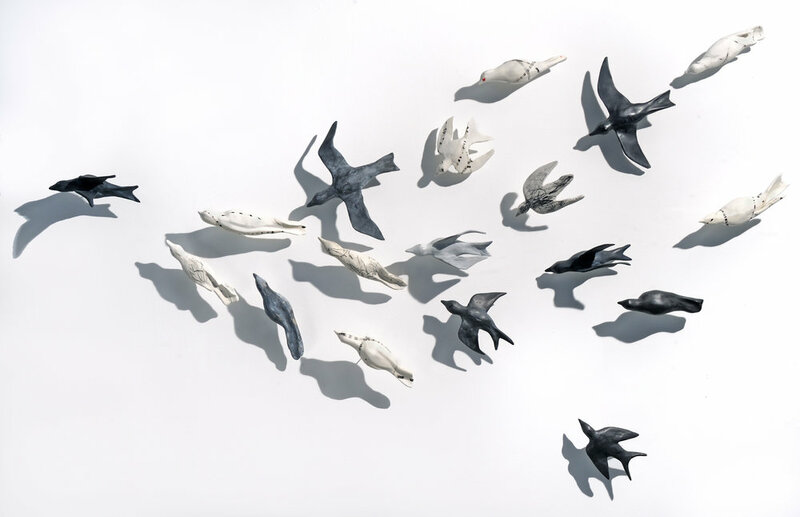 Installation of Mixed Migrating Flock, graphite wall drawings and gouche/graphite drawings.